Heat oven to 350°F (325°F for dark or nonstick pan). Generously grease and lightly flour 12-cup fluted tube cake pan, or spray with baking spray with flour. In large bowl, beat cake ingredients with electric mixer on low speed 30 seconds, then on medium speed 2 minutes, scraping bowl occasionally. Pour into pan. Bake 47 to 53 minutes or until toothpick inserted in center comes out clean. Cool 10 minutes; remove from pan to cooling rack. Cool completely, about 2 hours. In large bowl, beat powdered sugar, 3 tablespoons butter, the cream cheese and 3 tablespoons of the syrup with electric mixer on low speed. Beat in enough of the remaining syrup to make a smooth, soft frosting that will flow down side of cake. Spread frosting over cake. Store loosely covered in refrigerator. Instead of making the scratch frosting recipe, mix a container of Betty Crocker® Rich & Creamy cream cheese frosting with 4 to 5 tablespoons of maple-flavored syrup. 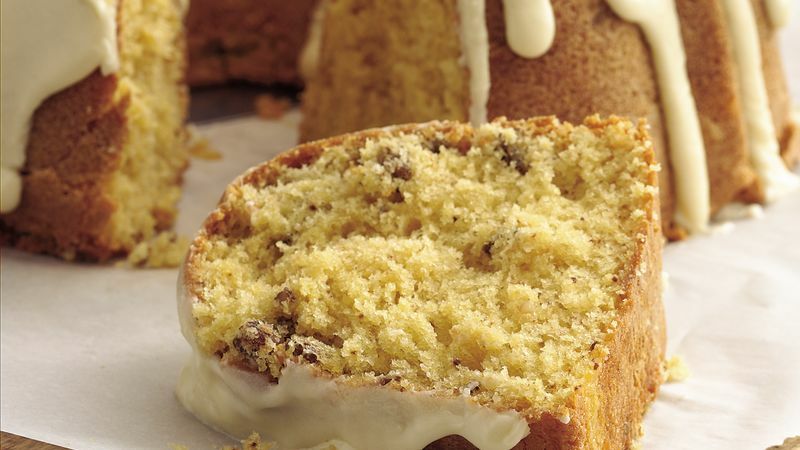 You can serve this rich cake without the frosting; instead, just drizzle with the maple syrup. To toast the pecans, spread in shallow ungreased pan; bake uncovered in 350ºF oven 6 to 10 minutes, stirring occasionally, until light brown.